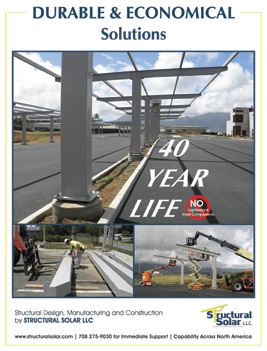 Structural Solar LLC designs, manufactures and installs durable and low cost “module ready” solar ground mount racking and structures. It’s not complicated. We’ll take your project requirement and the scope of work that you want us to perform and we’ll provide you with a responsive estimate and the equipment, structures and skilled labor force to get the job done on time and within budget. Structural Solar LLC owns and operates its own equipment which can be mobilized on short notice to provide turnkey installation services including survey, layout, pile driving, trenching and other site services. 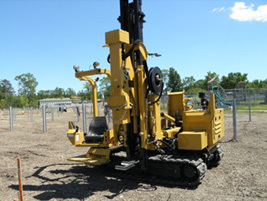 Structural Solar’s Ground Mount services range from pile driving only to fully panelized solar arrays. Additionally, Structural Solar designs and manufactures low cost galvanized arrays that are fast and easy to install, yet durable for 25 years or longer. There are two designs, the GMT-1 features 3 modules in landscape mounted to aluminum rail perpendicular to the galvanized structure and GMT-2, a fully galvanized low cost utility scale system with 2 panels mounted in portrait orientation. Both systems have a standard tilt range of 20-30 degrees. 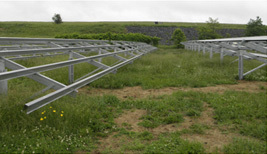 Structural Solar’s ground mounted structures are durable, rigid and designed for the real world. Posts can be shifted laterally to avoid underground conflicts without compromising the design or construction schedule. And hat section purlins are among the largest and most rigid in the industry permitting cantilevered spans of up to 6′ even in high load conditions. 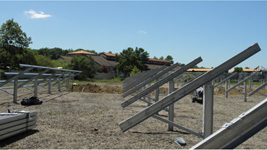 Structural Solar specializes in Commercial, Institutional and Utility Scale ground mount projects across North America. We provide signed and sealed structural design drawings and construction services anywhere across the country including Hawaii and Puerto Rico. If it’s solar, we invite you to inquire.